Although we’ve had nearly two weeks of beach-time in Palawan, our next destination was a beach again. However, quite a different kind. 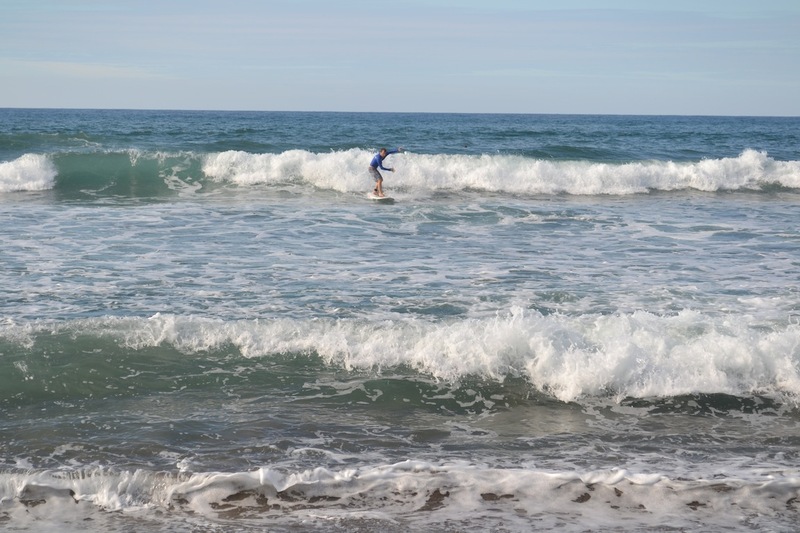 We changed the calm and deep-blue sea of Palawan for the thundering waves of La Union, a surfer’s paradise on the main island of Luzon, about 300km north of Manila (not Manama, of course – 17/2/2014). We both love the beach. Mark likes the seas a bit rough and the weather a bit gloomy as it reminds him of the beach in Holland. Lucia likes secluded pieces of sandy paradise with turquoise quiet waters, which reminds her of…. hmm…. pictures on the internet. So the Philippines gave us both the opportunity to experience the beach as we like it. We stayed in a small town call San Juan (pronounced San One) for two reasons: try surfing and (more importantly) meet up with Patricia – a good friend from Prague – and we are happy to say we succeeded in both! Surf-dudette Patricia was in San Juan with a group of Czech friends and they had found a small guesthouse run by a lovely couple called Angel and Marie (on the pic with their baby-in-a-bucket). The whole place was clean and basic with Angel and Marie making sure you had delicious meals every day (one of the best tuna steaks we’ve ever had). 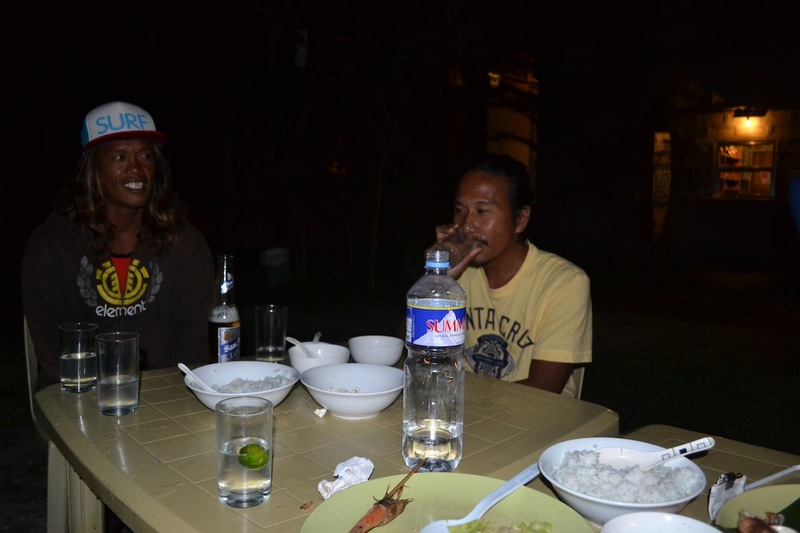 A highlight was the barbecue with everyone plus some local surf guys. It was good fun to spend a few days with the Czechoslovaks as last time we saw them it was only for an evening (see Manila blog). Mark especially was fascinated by hearing the harsh Praguenese language again, it’s been a while! 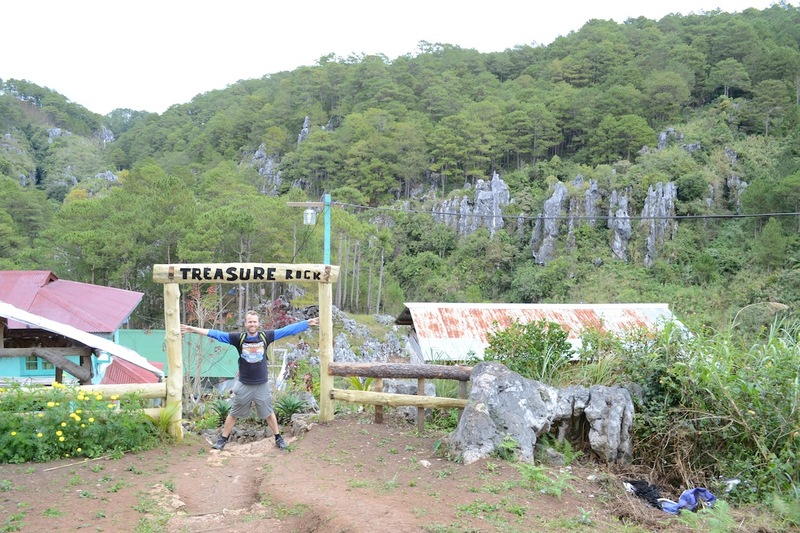 Our activities in Sagada were mainly around caves, rice and coffins. 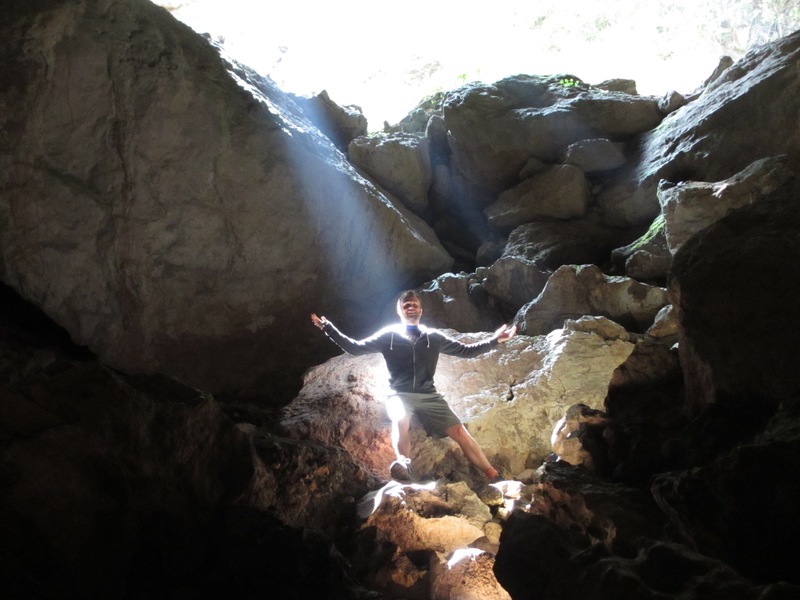 On the first day we walked into the Lumiang and Sumaging caves out of which especially the latter was very impressive. 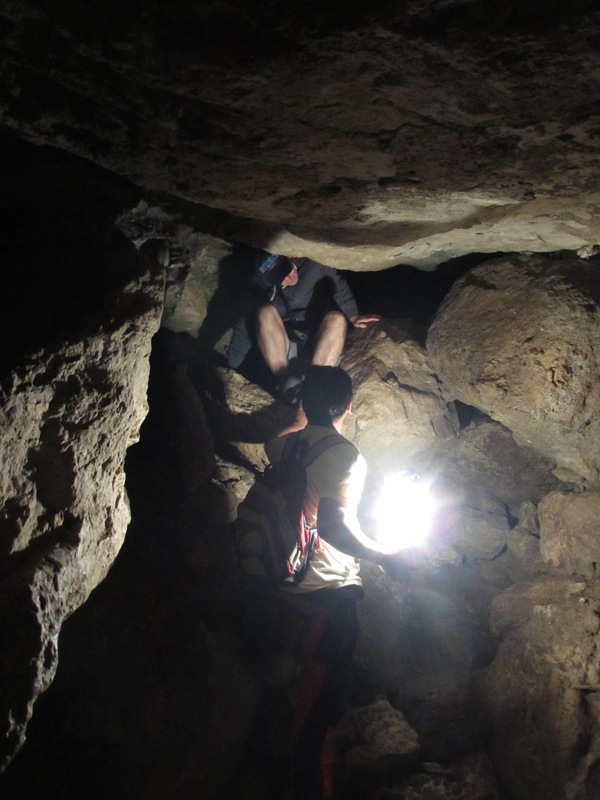 We’ve both been to various caves (last one in Palawan), but this time was different: climbing and sliding down from smooth rocks inside different parts of such a colourful and spacious cave was pretty cool! 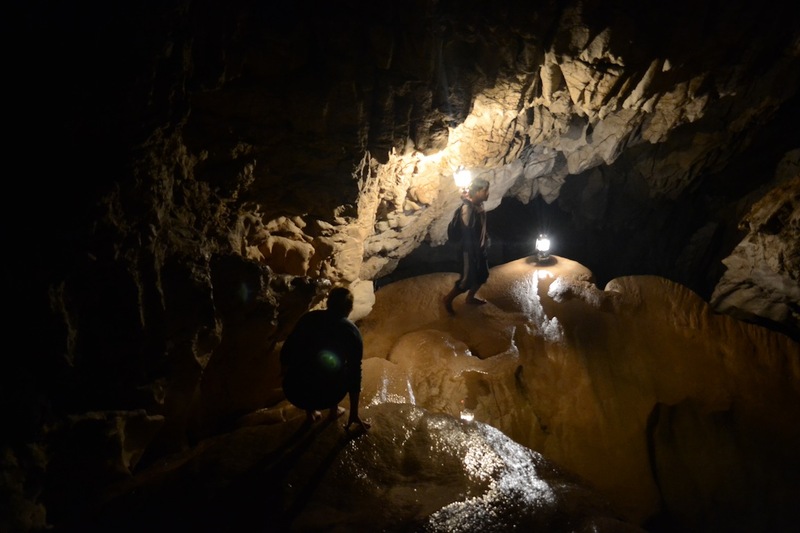 So cool that Mark decided to the ‘cave-connection’ tour which meant climbing through the mountain for about 300 meters, going in from the Lumiang cave and coming out of the Sumgaging cave. 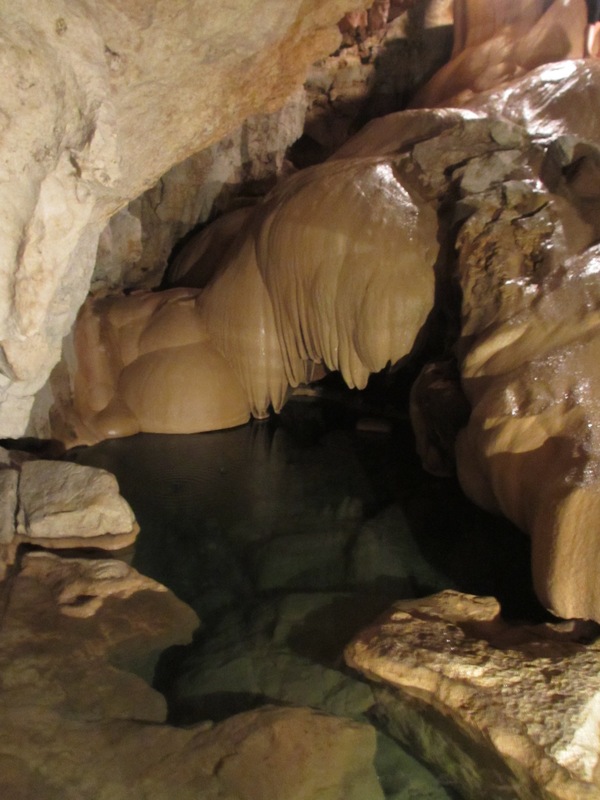 The underground route made them (he was joined by Bob, an Englishman he met at the tourist office) squeeze through tiny spaces between rocks, climbing down ropes, walking through an underground river and more sliding down slippery rocks. The whole route took about 3 hours and at some point Mark was over 160 meters under the ground. All the light they had came from an oil lamp that the guide was carrying, so the sunshine at the end was very welcome! Ricefields were one of the main reason for coming to these chilly parts in the Northern part of the Philippines and so after exploring the caves we took a trip to enjoy the rice. 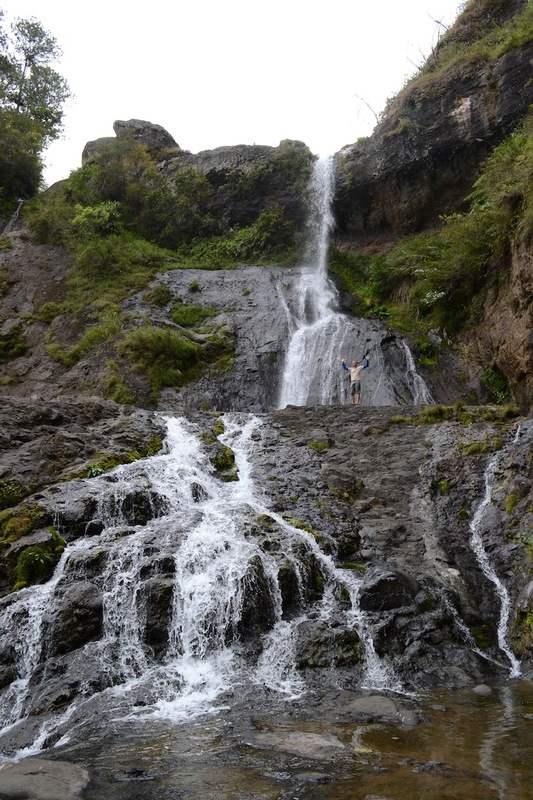 Adam – our guide – first took us to the Bomod-ok waterfalls also known as Big Falls. To reach the multilevel waterfall was an adventure on its own. 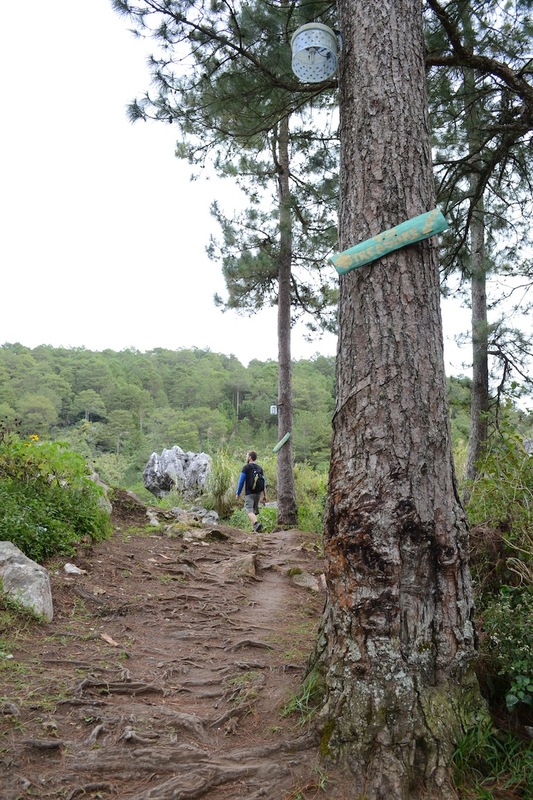 A few kilometres downhill from Sagada lays a small village called Suyo. Surrounded by fields of rice and vegetables life here seems to be very quiet, basic but definitely lovely! 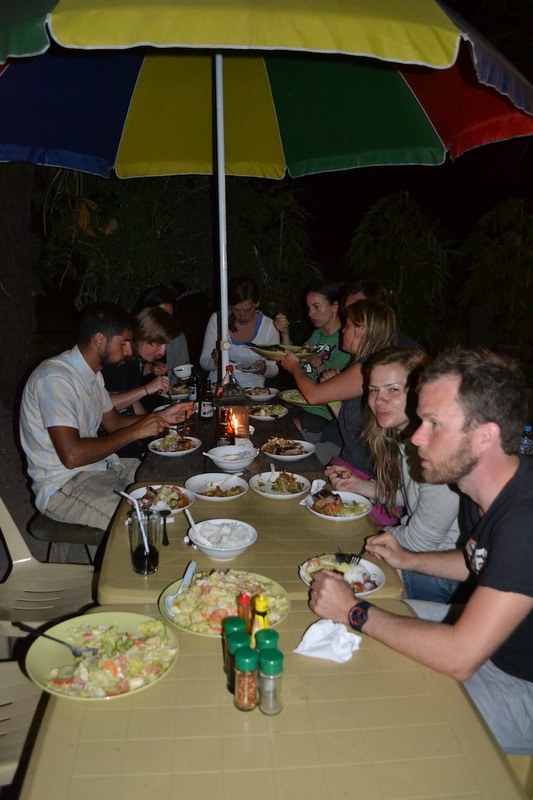 Bananas, mangos, tapioca and cucumbers as well as chicken and pigs are to be found between the houses which seems like fun for the kids and gives a promise of delicious dinners. After passing through this village we had to cross a few terraces of rice fields to climb the hill with the waterfall on the top. As a reward Mark skinny-dipped in the waterfall’s swimming pool, we ate our bananas and mandarins and went down to climb back to Sagada through the fields. The scenery as well as the hike up was breathtaking with all the terraces, playing children, local schools, banana trees and buffalos. 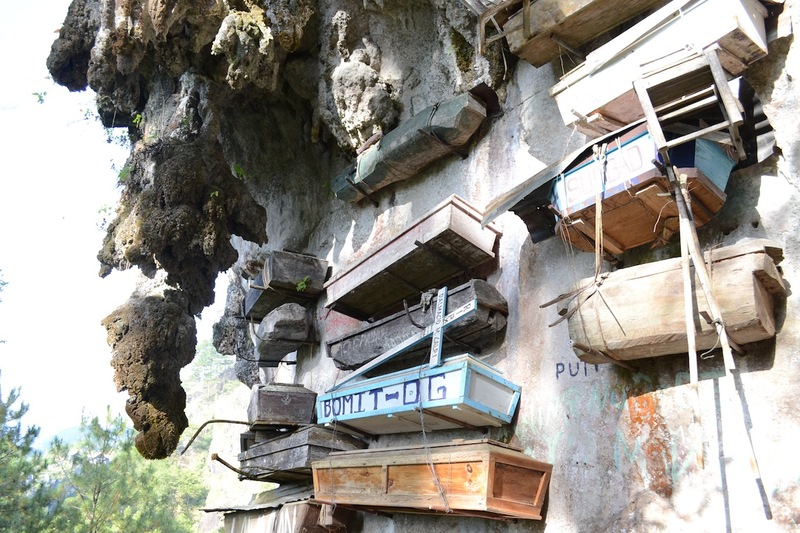 In older days the Philipinos in Sagada had a special way of putting their loved ones to their final rest. 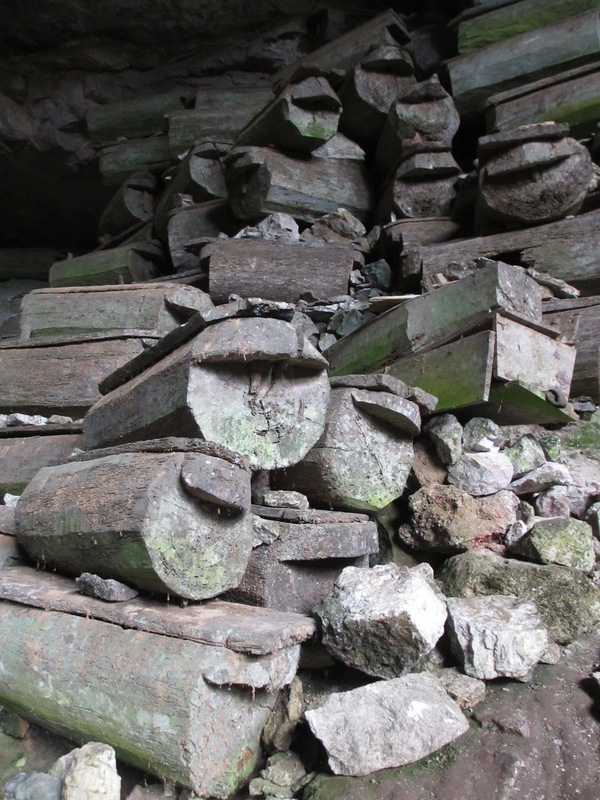 Like elsewhere they would put the bodies in a coffin, but instead of burying the coffins under the ground they would hang them up on the rock walls or stack up onto each other in caves. This would originally happen in remote areas, but as the various towns started expanding you can see these coffins everywhere. The tradition seems to be dying (:-)) out as the younger generation either doesn’t want to be buried like this, doesn’t know the rituals anymore or isn’t willing to pay the ‘fee’. There’s a large amount of chickens and pigs that you need to have slaughtered according to pagan rituals to be allowed to be put in a hanging coffin… for many now it’s not worth the effort. 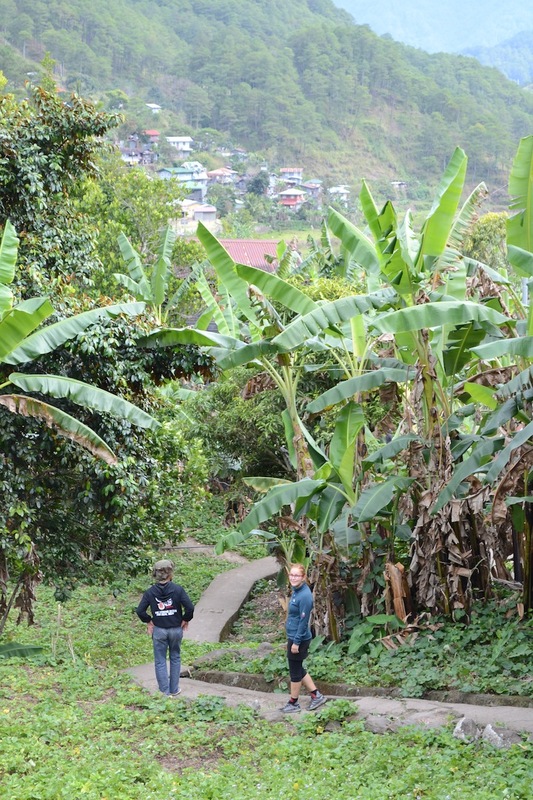 After leaving Sagada we decided to go to Banaue as it was (kind of) on the way back to Manila and their ricefields were supposed to be the most extensive and beautiful in the Philippines. 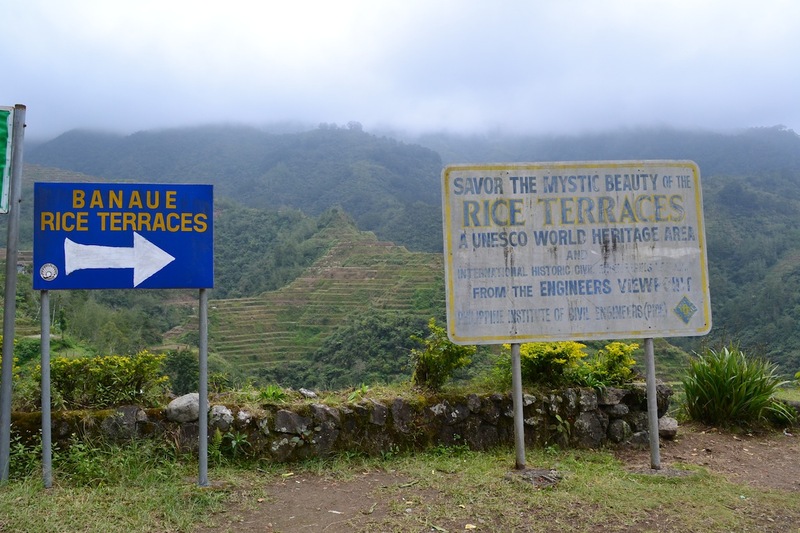 By staying over 1 night in a cheap guesthouse with again a great view (Stairway Lodge) in the town of Banaue, we managed to cover the two main advertised highlights: the Banaue viewing point(s) and Batad’s amphitheatre-shaped ricefields. The first we did by walking up the main road for about 5km while passing by small ‘villages’ (more like a few houses and a grocery shop grouped together) and several viewing points. 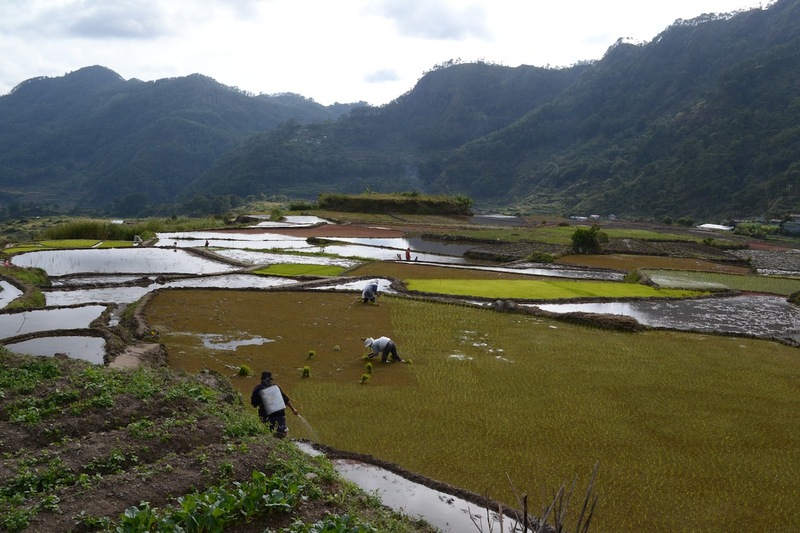 Especially the one after 5km gave a beautiful view of the rice-field valley with Banaue planted at e bottom and far end of it. 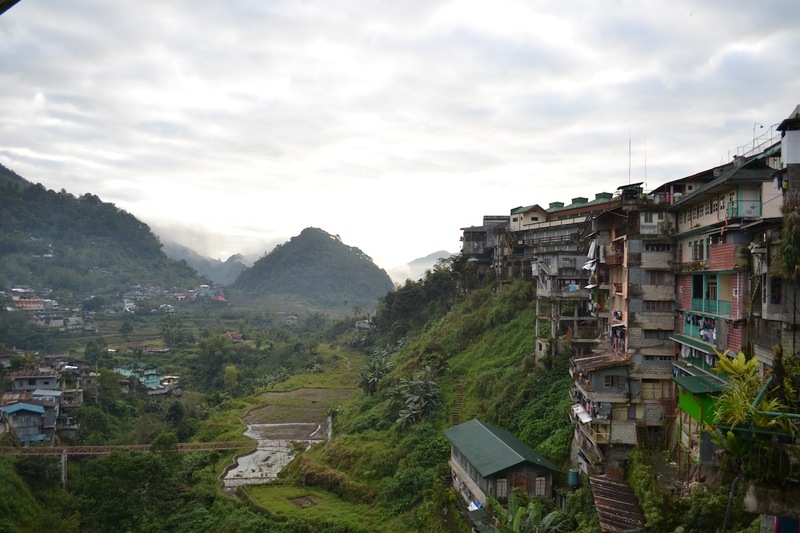 We went to Batad through an organised tour via the tourist office. The hike turned out to be quite a bit tougher than expected especially on the way back – which was up. 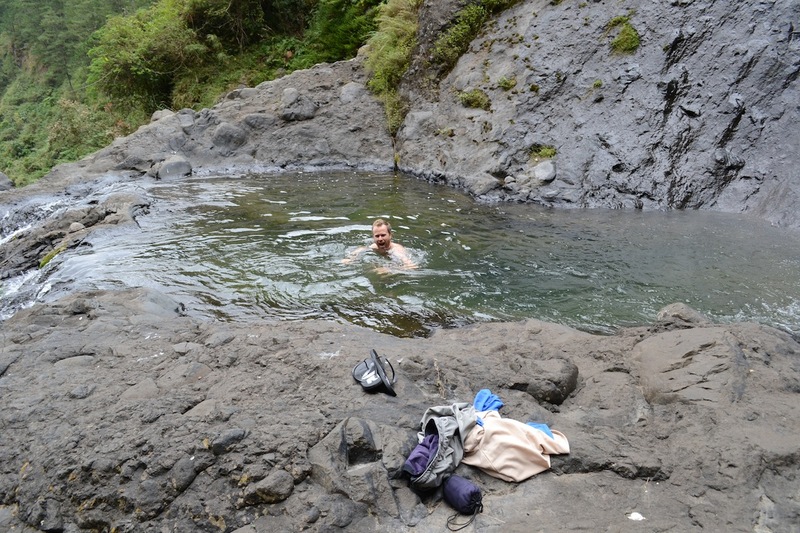 We walked through ricefields, narrow paths and at the end dipped our feet in a large waterfall-pool. The seeding-season only starts in a month, so the ricefields weren’t as bright green as we hoped. However, they were still spectacular. 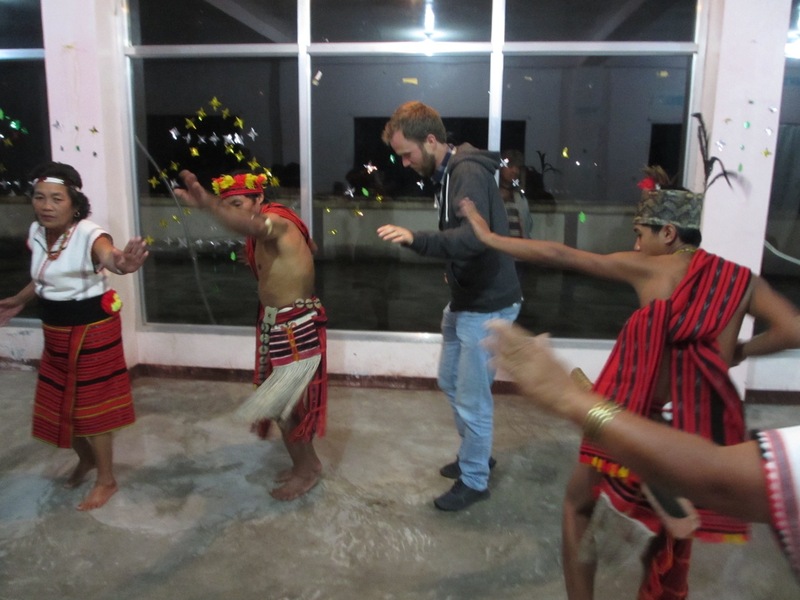 We spent our only evening watching the local ifugao tribe people entertain tourists with their music and dances in the Banaue cultural hall. A short performance was quite interesting as the narrator explained a lot about history of tribal conflicts which involved head chopping, about betel nut chewing tradition and about dress-code differences among various classes. Our fellow spectators additionally enjoyed a Slovak and a Dutch showing off their ifuago dance skills which must have been highly entertaining. After returning from Batad, we took a shower, had some food and at 7pm got onto the nightbus to Manila to get to the airport. We arrived around 4am the next morning and our flight wasn’t until 9am. The airport security guards didnt let us in until 7am (sorry SirMam…), so that meant approx 2,5 hours of dozing off in the outdoor (!!) waiting area of terminal 4 before we were let in and could board our 1-hour delayed flight to Kota Kinabalu in Borneo, Malaysia. 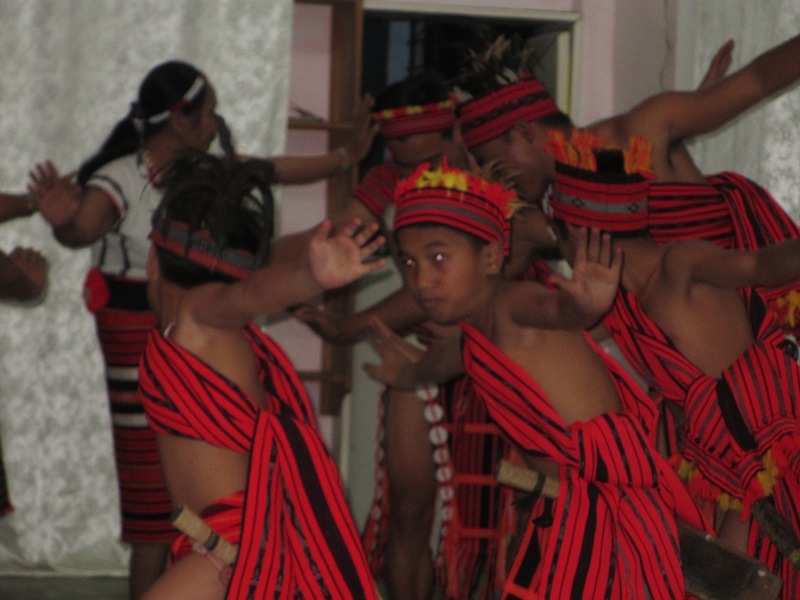 For our pictures from north Luzon click here. Thanks Harold! San Juan definitely changed since. Everything is ‘surf’ there. Lovely place!